The OMG-COMM4-LPCI-DB25 Low Profile PCI serial interface provides four RS-232 serial ports, each capable of data rates to 460.8K bps. Each RS-232 port implements all modem control signals for maximum compatibility with a wide range of peripherals. The board is MD1 Low Profile and Universal Bus (3.3 V and 5 V) compatible and utilizes a 16C864 UART to provide 128-byte Tx/Rx FIFOs for maximum reliability in data intensive applications. 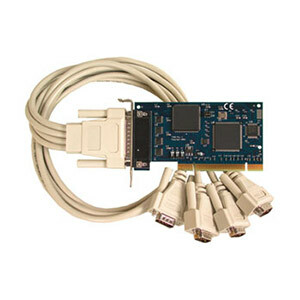 The board ships with a 36" cable that terminates to four DB25M connectors. If you need DB9 connectors, order the OMG-COMM4-LPCI-DB9 which includes a cable that terminates to four DB9M connectors. The OMG-COMM4-LPCI-DB25 is for use in Low Profile PCI slots only. If you have a standard size PCI slot order the OMG-COMM4-PCI-DB25. These boards are compatible with Windows XP/Vista/7 and Linux. 참고: Each unit supplied with utility software, 1 m (3') cable that Terminates to Four DB25M connectors and complete operator’s manual on CD.